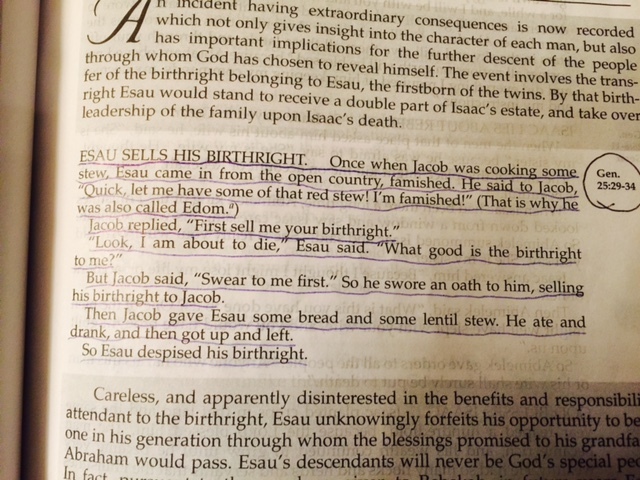 Esau sells his birthright to Jacob for a bowl of stew in Genesis 25. Esau was going to inherit the majority of Abraham’s wealth and he trades it for a bowl of stew? We would never do something like that! Are we doing this when we fill up our calendars with good things and we have no time for the best things? The best things that bring long-term benefits? Benefits that we don’t see right away? Like regular 1 – on 1 time with God? Are we too busy? Like significant time making memories with our family? Memories that don’t include running from calendar item to calendar item? The memories that include lots of laughter and fun like playing poker on a rainy day in Italy with elbow macaroni as chips. (My family will smile at that one :). When we buy items with credit cards that we can’t pay off right away, we’re doing the same thing. We’re trading off a happier, debt-free life in order to have something right now. The ‘immediate’ calls to us. It’s very loud. We have a hard time not listening and responding. God promises us in James 1 that he will give us a generous amount of wisdom……when we ask. We just need to take the time to ask and then obey as he guides us. None of this happens immediately. We need to turn down the volume on the ‘immediate’ in our lives and turn up God’s volume. How do we do this? We’re doing it right now as we read and study and internalize God’s word to us. Forget the immediate – we want God’s best. So we’re focusing on you, Abba Father.